In the seventh article of a series on how key emitters are responding to climate change, Carbon Brief looks at Australia’s complex climate politics and rising fossil fuel exports. Climate change is a top tier political issue in Australia. Debates over climate and energy policy have triggered several of the numerous changes of prime minister in recent years. Australia had the world’s 15th largest greenhouse gas emissions in 2015 and its citizens’ per-capita contribution is around three times the global average. It is the world’s second largest coal exporter and recently became the top exporter of liquified natural gas (LNG). Its electricity system remains heavily reliant on coal, despite ramping up the use of gas and renewables, especially rooftop solar. It is also highly vulnerable to the effects of climate change, including extreme heat, drought, bushfires and agricultural impacts. Based on its current trajectory, Australia is off track on its international pledge to cut emissions 26-28% by 2030 compared to 2005 levels. Opinion polls suggest the opposition Labor party will win the upcoming federal election, expected in May. Australia’s economy ranks 13th globally in terms of gross domestic product (GDP), just after Russia and South Korea. Its population sits at 25 million – 53rd in the world – and is projected to increase to 33 million by 2050. The country has recently witnessed political turbulence, with five changes of prime minister over the past decade. The current government has been in power since 2013 and is formed of a longtime alliance between the right-leaning Liberal and National parties (L/NP), together known as the “Coalition”. The Liberal prime minister Scott Morrison has held office since August 2018. He was preceded by Malcolm Turnbull from 2015-2018 and Tony Abbott from 2013-2015, both Liberals. The left-leaning Labor party (ALP) was in power from 2007 to 2013 under Kevin Rudd and Julia Gillard. The country will return to the polls this year. The date is flexible, but widely expected to be in May. Opinion polls generally show a projected win for Labor, now led by Bill Shorten. Climate change policy has a long and complex history in Australia and has been highly politicised. Some polls show it as a top issue among voters in the federal election. Tens of thousands of Australian schoolchildren recently joined the global school climate strikes. Around 58% of Australians consider climate change a “major threat” to their country, second only to the 59% who considered ISIS a major threat, according to a 2017 poll from the Pew Research Centre. Another 2018 survey from the Australia Institute thinktank found 60% want coal-fired power to be phased out within 20 years. The same survey found 73% of people are concerned about climate change, a five-year high. Stop the Adani Carmichael coal mine protest outside Bill Shorten’s Moonee Ponds office, 3 October 2017. Credit: Julian Meehan / (CC BY-SA 4.0). Lobbyists and the media are also strong political players in Australia. The mining lobby spent around AUS$5m (£2.7m) last year on political campaigning, compared to AUS$183k (£99k) by environmental NGOs. Australia’s media landscape is among the most concentrated in the world. The two main newspaper firms – the more conservative News Corp and more progressive Fairfax Media – are strongly polarised politically, according to the 2018 Digital News Report, including on climate. Australia has never hosted a meeting of the United Nations Framework Convention on Climate Change (UNFCCC). In 1998 it signed the Kyoto Protocol, which committed developed country signatories to emission reduction targets. But Australia did not ratify this until 2007, following the election of a Labor government. It ratified the Paris Agreement on 9 November 2016. Australia’s annual greenhouse gas (GHG) emissions stood at 550m tonnes of CO2 equivalent (MtCO2e) in 2015 including land-use and forestry (LULUCF), according to data compiled by the Potsdam Institute for Climate Impact Research (PIK). (See “note on infographic” at the end of this article for details of this data. Note that LULUCF emissions were negative in 2015). Emissions excluding LULUCF have almost doubled since 1970. They peaked at 700MtCO2e in 2011 and stood at 630MtCO2e in 2016. In August 2015, Australia submitted its climate pledge towards the Paris climate talks. This “nationally determined contribution” (NDC) came under Liberal prime minister Tony Abbott. The pledge promised a 26-28% emissions reduction by 2030 compared to 2005 levels, including land use. This is equivalent to a 22–25% cut below 1990 levels including land use, but a 3-6% rise when land-use emissions are excluded. This sector is a net sink in Australia. The government’s independent advisors, the Climate Change Authority (CCA), had previously recommended a target of a 40-60% cut in emissions by 2030 compared to 2000 levels. Australia’s pledge represents only a 19-22% cut on emissions in 2000. The main policy outlined in Australia’s climate pledge was its Emissions Reduction Fund (ERF) (see more in the next section) and a scheme to source 23% of electricity from renewables by 2020. Several post-2020 policies were under development, it said, including a plan for a 40% improvement in energy productivity – the amount of energy needed to generate each unit of GDP – between 2015 and 2030. Australia’s per-capita emissions stood at 23tCO2e in 2015, according to PIK and World Bank data, around nine times those of India and more than three times the world average of 7tCO2e. Australia says its pledge represents a 50-52% cut in per-capita emissions by 2030, compared to 2005 levels. The 28% by 2030 pledge would see per-capita emissions fall to 16tCO2e in 2030, from 31tCO2e in 2005, according to PIK data and UN population projections. The pledge is rated as “insufficient” by Climate Action Tracker (CAT), an independent analysis by three research organisations. “If all government targets were within this range, warming would reach over 2C and up to 3C,” it says. There is disagreement over whether Australia is on track to meet its climate targets. Climate Transparency, a research and NGO partnership, also says Australia’s GHG trajectory and NDC target are not compatible with the Paris goals. Policy is failing to address the need for structural change, with effective policies missing in every sector, it says. In contrast, a recent analysis from the Australian National University finds the Paris target will be met five years early, though its findings are disputed. In December 2017, a government review said Australia was “on track” to meet its target. Scott Morrison (right), Australia’s prime minister, arrives at the G20 in Argentina in 2018. Credit: G20 Argentina Flickr. Critics say these assessments use “creative accounting” and take credit for a large decline in deforestation that happened before the Paris Agreement was signed. Australia is also trying to carry forward credit for overachieving on its Kyoto targets, using the surplus to meet its Paris goals. The final rules on whether this should be allowed have yet to be decided. 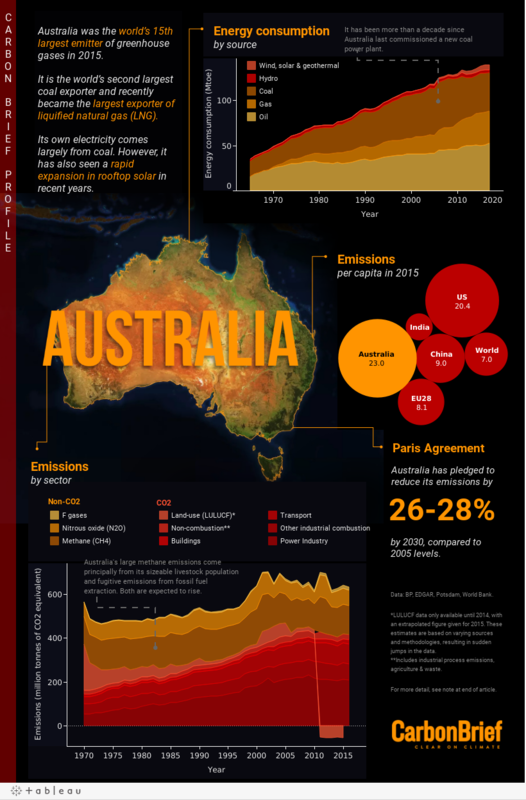 Similar issues cloud Australia’s progress on its earlier climate pledges and goals. As part of the 2009 Copenhagen accord, the country pledged a voluntary 5% reduction on 2000 levels by 2020, rising to a 15-25% reduction, if the world struck a strong climate deal. The CCA has said these stronger conditions have been met and recommended a 15% target, saying a 5% target is not “a credible start”. The government has stuck to the 5% pledge. In 2010, the country pledged to reduce emissions 0.5% below 1990 levels by 2020 as part of the second commitment period of the Kyoto Protocol. The 5% Copenhagen pledge was used to calculate this legally binding target, which takes the form of a cumulative emissions budget. Australia is on track to meet the target, helped by the use of “flexibility mechanisms” and carry-over from the first Kyoto commitment period. Australia is part of the Umbrella Group informal negotiating bloc at international climate talks, which is mainly made up of rich countries from several continents. The group has often been characterised as less enthusiastic towards international climate cooperation than other developed countries. Australia is also part of the Cartagena Dialogue, an informal discussion group of countries that say they are committed to becoming low-carbon. It is one of the worst-performing countries both for national climate policy and for hindering progress in international negotiations, according to a recent NGO performance index. This ranked Australia 55th out of 60 countries. Over the past decade, several flagship climate policies have been announced and then adjusted or cancelled, including a scrapped economy-wide carbon tax. The current policy void means the next government could make a large difference to Australia’s emissions. In August 2018, Malcolm Turnbull removed an emissions reduction target for the power industry from his main proposed energy policy – the national energy guarantee (NEG) – due to pressure from his party’s rightwing. This same group later ousted him as prime minister, with Scott Morrison taking the helm and dropping the NEG altogether. Greenpeace protesters suspend a banner from Parliament House, depicting prime minister Scott Morrison, holding a piece of coal. Canberra, Australia, 10 September 2018. Credit: Sam Nerrie / Alamy Stock Photo. The “centrepiece” of government emissions reduction efforts is now the ERF, previously called the Direct Action Plan. This uses a reverse auction to award contracts for emissions cuts. Contracts go to the cheapest bids from businesses, local councils, state governments and farmers. There are ongoing concerns over the ERF, including its cost to the taxpayer, ability to deliver promised emissions cuts and the additionality and permanence of any reductions. Most ERF projects are in the land sector, though funding has also gone to new fossil fuel projects considered cleaner than the activities they replace. The Clean Energy Regulator, which runs the fund, last year cancelled AUS$24m (£13m) of contracts that had failed to deliver. The scheme will need to contribute “less of Australia’s emissions reduction task over time”, according to a 2017 review by the CCA. “[O]ther policies will need to take up the challenge of decarbonising Australia’s economy and deliver structural change”, it said, though the ERF should be “built on as part of the policy tool kit” to meet Australia’s Paris goals. In its latest budget, published earlier this month, the Morrison government said this new AUS$2bn of funding would need to last for 15 years, instead of 10 as initially proposed. The opposition Labor party’s climate change plan would raise Australia’s emissions reduction target for 2030 from a 26-28% to a 45% cut on 2005 levels. Labor leader Bill Shorten has called climate change “a disaster”. His party would bring in a new emissions trading scheme and target “net zero pollution” by 2050. In an effort to create cross-party consensus, Labor still supports the NEG and its emissions reduction mechanism, both dropped by the Liberals. The party would also raise the emissions reduction target. In the event this compromise fails, Labor has outlined a AUS$15bn (£8bn) plan to cut emissions in the energy system. Of this, AUS$10bn (£5.4bn) will go to the government-owned green bank Labor established in 2012, including for a AUS$1bn (£540m) plan to begin exporting hydrogen. It recently ruled out taxpayer support for new coal power plants. Australia’s Green party – which could hold the balance of power in the senate after the elections – has also announced a host of climate policies. These include 100% renewable electricity by 2030, bans on new fossil fuel extraction and a phaseout of coal exports by 2030, in favour of renewable exports such as “solar fuels”. Regional climate ambition in Australia is generally far stronger than at the federal level. All states and territories, bar Western Australia, have strong renewable energy targets, net-zero emissions targets, or both. South Australia is targeting net-zero emissions by 2050. In 2017, 61% of Australia’s electricity came from coal, as the chart below shows. However, coal power output has fallen from a peak in 2006, due to the rising use of gas and renewables. Around a third of Australia’s greenhouse gas emissions come from the power sector. Electricity generation in Australia by fuel, 1985-2017 (terawatt hours). Source: BP Statistical Review of World Energy 2018. Chart by Carbon Brief using Highcharts. As of January 2019, Australia has 24 gigawatts (GW) of operating coal plants, the world’s 11th largest fleet, according to the Global Coal Plant Tracker. It has been 10 years since a new coal power plant was commissioned and 9GW of planned capacity has been shelved or cancelled since 2010. There are currently no new coal plants in the pipeline. Nine coal power stations have been retired over the past five years in Australia, says CAT. Much of Australia’s coal fleet is ageing, posing questions over where the country will source its electricity in future. The risk of summer blackouts – a major political issue – could grow as old coal plants become less reliable and higher temperatures increase peak demand. The government is considering committing support for new coal power investment before the election, urged on by some factions of the ruling party. According to one assessment, Australia already has some of the world’s highest fossil fuel subsidies per capita. Natural resources, including coal and metals such as iron ore, uranium and gold, are a major part of Australia’s economy. They account for 8% of GDP and 70% of exports. Australia mined 500m tonnes of coal in 2017, making it the world’s fourth largest producer after China, India and the US, and just ahead of Indonesia. Mines are located mainly in Queensland, New South Wales and Victoria. Aerial view of an open-cut coal mine in Hunter Valley, New South Wales, Australia. Credit: redbrickstock.com / Alamy Stock Photo. The Australian government expects its coal-mining activities to increase, leading to a rise in emissions in the sector. In particular, this is due to several “gassy” coal mines returning to full production after temporary declines, leading to increased fugitive methane emissions. There has been widespread opposition to a new thermal coal mine in Queensland proposed by Indian energy giant Adani, including a series of legal challenges. Adani is now self-financing a smaller version of the project after numerous banks ruled out funding. Last year, a New South Wales judge cited climate change impacts when ruling out another planned coal mine in the Hunter Valley. Coal is this year set to become Australia’s most valuable export. The country only consumes a quarter of the coal it produces and is the world’s second largest exporter after Indonesia. Coal exports were 379m tonnes in 2017-18, worth some US$64bn in earnings, and expected to grow. Japan, China and India are all significant destinations. Australia’s renewable capacity has increased rapidly over the past decade. By 2017, production from renewables other than hydro had more than tripled on 2007 levels, providing 10% of electricity. Australia has one of the highest rooftop solar rates in the world: a fifth of all households have it installed, rising to a third in some states. It provides around 4% of Australia’s electricity. Solar farms are also on the rise from an almost non-existent base five years ago. The country currently has more solar farms under construction than its total solar farm capacity. More than a million solar water heaters are installed on around an eighth of homes, while South Australia is set to build the world’s largest solar thermal plant. Rooftop solar panels in South Australia. Credit: Andrey Moisseyev / Alamy Stock Photo. Onshore wind capacity was 4.6GW in 2017, more than a third of which is in South Australia. This compares to 7.2GW for solar, of which 6.6GW is rooftop solar. Significantly more additions are planned for both. Australia has yet to approve its first offshore wind farm. Australian renewable capacity had a record-breaking year in 2018. Around 10GW of new solar and wind capacity is expected to be installed during 2018 and 2019. Hydropower provides around 5% of electricity generation, bringing the renewable total to 15%. Its output has remained relatively constant for decades, with its share in the electricity mix falling as other sources increase. Australia’s largest hydro scheme, Snowy Hydro located in the south-east of the country, has a total capacity of 4GW, most of which was completed 45 years ago or more. A 2GW expansion, known as Snowy 2.0, was approved in December. Gordon Dam, Southwest National Park, Tasmania. Credit: Tasmanian.Kris via Flickr. The island state Tasmania produces around 90% of its electricity from hydro and exports to the mainland during peak demand via an interconnector. Hydro Tasmania has major plans for new pumped hydro storage and a second interconnector, as part of its “battery of the nation” scheme to double its renewable capacity to 5GW. In 2009, Australia set a target for 20% of electricity to come from renewables by 2020, expanding an earlier renewables goal. Its scheme to achieve this requires high energy users to source a fixed proportion of electricity from renewable sources by buying certificates, with the value of the certificates decreasing each year. A large-scale generation sub-target alone means 23.5% of generation will come from renewables in 2020, according to the government. Analysis indicates the overall 20% target has already been surpassed. The current government has no plans to set a post-2020 target, however, despite being advised to do so by its chief scientist Alan Finkel in a 2017 review. Around 70% of Australians back a higher renewable electricity target, according to a recent poll. Australia could reach 50% renewables in 2025 and 100% by the early 2030s if its current rate of expansion continued, analysis has found. The Labor party has promised to deliver 50% renewables by 2030, if it gets into power. Several states have far stronger renewable targets. South Australia is on track to its goal of 75% renewable electricity by 2025 and there is public support for setting a “100% by 2030” target. Victoria and the Northern Territory are targeting 50% renewable electricity by 2030. Tasmania already regularly reaches 100% renewables generation. In 2017, South Australia made headlines after Tesla built the world’s then-largest lithium ion battery in the state. The battery is expected to pay for itself within a few years and has been widely praised for boosting grid stability. The battery was built after tornadoes caused statewide blackouts in 2016 by downing power lines and triggering overly-sensitive windfarm protections, which have since been modified. Australia has never had any nuclear power due to longstanding bipartisan opposition. However, it has the world’s largest known uranium resources and is the third largest exporter of the material. Australia has widespread gas resources both on and offshore, particularly off the north-west coast. It also has high onshore unconventional gas resources. A liquified natural gas carrier off the coast of Karratha, Western Australia. Credit: Jack Picone / Alamy Stock Photo. It is one of the world’s largest exporters of liquefied natural gas (LNG), alongside Qatar, with seven operating LNG terminals and three more under construction. Western Australia alone accounts for 11% of global LNG capacity. Domestic gas use has also risen in recent years. It met a quarter of the country’s energy needs in 2017, up from 16% in 1997. Some analysts say eastern states will need to start importing LNG to meet demand, even as other parts of the country increase exports. The country aims to export 80Mt of LNG per year by 2020, up from 24Mt in 2013-14. This is expected to lead to a rise in Australia’s emissions due to electricity use in the plants that liquify LNG, as well as fugitive methane emissions during extraction. Fugitive emissions from oil, gas and coal have risen 41% since 2005 and are expected to rise further by 2030. There are also concerns that these emissions could be underreported. LNG production is currently the biggest driver of overall emissions growth in the country and is projected to offset all the savings achieved through Australia’s 2020 renewables target. The current government and industry argue LNG exports cut emissions abroad by displacing coal, although the extent of this effect is disputed. Oil use has increased by a quarter since 1997, though its proportion in the energy mix has stayed level at around a third. Australia’s oil reserves are an estimated 0.3% of the world total. Petroleum production peaked in 2000, although exports are now increasing. Australia imports nearly all its oil and exports 75% of its own crude production. Last year, the government ordered a fuel security review after it was warned the country had only a few weeks of petrol, diesel and aviation fuel in its reserves. Duke Energy lowering a pipeline as part of the Tasmania Natural Gas Project. Credit: Bill Bachman / Alamy Stock Photo. Norwegian oil firm Equinor has plans for experimental oil drilling in the Great Australian Bight, a huge bay off the south coast of Australia. Critics argue the deepwater project would put pristine coastline and marine life at risk of an oil spill. Australia’s export credit agency, Efic, has been criticised by NGOs for supporting fossil-fuel projects around the world. A bill to expand Efic’s powers is expected to pass in early April, potentially opening the door to even more fossil-fuel support. Transport accounts for 14% of Australia’s emissions. The government expects the sector’s emissions to increase over the next decade. Unlike 80% of the global market, Australia has no mandatory fuel-efficiency standards. Previous proposals were cut down by the ruling coalition after lobbying from industry. It also lags behind other countries in the rollout of electric vehicles (EVs). Just 2,300 were sold in 2017, according to Australia’s EV trade body, or 0.2% of total motor sales. There are small incentives for lower emissions cars. A recent senate select committee report outlined options to increase EV uptake, including consideration of a national target. In February, the government released a one-page EV strategy that still lacks support measures, according to critics. Labor recently proposed a national EV target of 50% new car sales by 2030, as well as fuel emissions standards for conventional vehicles. Australia has large agricultural emissions, principally due to methane released from its large livestock population. The country has around 26m cows, 2.2m pigs and 65m sheep. Nitrous oxide released from fertilised soils is also a large contributor. A herd of sheep on the Tin Horse Highway in Western Australia. Credit: Julie Mowbray / Alamy Stock Photo. Agricultural emissions have remained relatively steady for several decades, but a 2013 government-commissioned report said this was likely to change. It projected an annual 1.2% increase up to 2050, driven by rising meat and crop exports. By 2030, emissions would have risen 10% on 2018 levels, the report said. Australia’s land sector is a large net emissions sink, with the latest climate projections pointing to “historical lows” in recent years. On balance, 22MtCO2e was absorbed by the land sector in 2018, the report says, but this is set to shrink to 14MtCO2 in 2020 and 1MtCO2e in 2030. The current lows are due to forest cover increases that are not expected to continue, the report says. This declining carbon sink is one of the main drivers of Australia’s emissions “growth” up to 2020. Australia’s CCA is a statutory body established in 2011 to advise the government on climate targets and policy. It is modelled closely on the UK’s Committee on Climate Change (CCC). All its proposals need to meet certain criteria, including being economically “efficient”, equitable and consistent with Australia’s trade objectives. Former prime minister Tony Abbott tried but failed to get rid of the CCA, though he did remove its advisory role on emission targets. The body has since shrunk significantly. In 2013, Abbot closed the Climate Commission, an independent science and public education body established by the government in 2011. However, it was resurrected as the Climate Council, a non-profit organisation, just days later. Meanwhile, a 2007 greenhouse and energy reporting act introduced a single national framework for reporting on emissions, in part to underpin any future emissions trading scheme. Australia’s renewable electricity target and ERF are also set in law, while a 2010 act obliges commercial buildings to disclose their energy efficiency when sold or leased. Australia is experiencing higher temperatures, more frequent and intense extreme heat events, and higher fire risk and drought conditions due to climate change, says the country’s 2017 national communication to the UNFCCC. “These changes in climate are expected to continue,” it adds. Annual mean temperatures in the country have already risen by around 1.1C since the late 1800s. They are expected to reach to 1.6-5.3C, depending on future emissions. This year, Australia experienced its hottest summer on record, with the national average temperature around 2.1C above the long-term average, as well as multiple other heat records broken. Long-term climate trends played a role in the heatwaves, its Bureau of Meteorology says. Drought is seen as a particularly serious issue in Australia. There are strong concerns about the Murray-Darling Basin in the southeastern interior, one of Australia’s most significant agricultural areas, which is already being affected by climate change. Rainfall patterns are changing and extreme storms, droughts and floods are becoming more frequent and intense, according to a recent paper by the region’s authority. The report came in response to three mass fish deaths at lakes within the basin, which a scientific panel concluded were caused by drought as well as over-extraction. A 2015 report from University of Melbourne researchers outlined how many of Australia’s major food commodities could be affected by climate change, from beef and dairy production to wheat and barley. Up to 70% of Australia’s winegrowing regions with a Mediterranean climate will be less suitable for grape growing by 2050, the report said. Black Kite flee a bushfire in Northern Territory, Australia on 9 December 2016. Credit: Brad Leue / Alamy Stock Photo. Climate change has also been linked to an increased risk of bushfires and length of the fire season. However, overall effects are complex since climate change can impact the various risk factors of wildfires in different ways. There is also concern about sea-level rise, which is likely to be close to the expected global average of up to a metre by 2100. The country has already seen increased rates of extreme sea levels. Around half of Australia’s population lives within 7km of the coast. Australia’s Great Barrier Reef is already being severely damaged by coral bleaching due to marine heatwaves and ocean acidification. Two major bleaching events in 2016 and 2017 affected 93% and 83% of coral in the reef respectively. The government has opposed – and lobbied against – efforts to add the Great Barrier Reef to Unesco’s “in danger” list. Coral off the coast of Townsville, Australia, November 2018. Credit: Daisy Dunne / Carbon Brief. The country first set out its approach to adaptation in its 2007 national adaptation framework. It also has a national research facility to support management of climate risks with reports on “priority themes”. In 2015, it released a climate adaptation strategy towards climate resilience in Australia. In 2015, Australia committed to giving at least AUS$1bn (£540m) in international climate finance to vulnerable countries over five years. This was redirected from the existing foreign aid budget and included $187m previously pledged to the Green Climate Fund (GCF). Government budget papers published this month imply Australia has ruled out contributions to GCF’s replenishment round this year. Australia does also give significant bilateral climate funding. Overall, it was the 10th largest international climate finance donor in 2015 and 2016, according to Carbon Brief analysis. The highest transfer to a single country went to Indonesia. Data for energy consumption comes from BP Statistical Review of World Energy 2018. Data for greenhouse gas emissions by sector is a combination of two datasets compiled by the Potsdam Institute for Climate Impact Research (PIK) and EDGAR. Values for methane (CH4), nitrous oxide (N2O) and fluorinated gases cover all sectors, including LULUCF, and come from the PIK primap database v2.0. Values for GHG emissions from LULUCF also come from the PIK primap database, however these are only available to 2015, and from the earlier v1.2 of the database. Note that LULUCF data for 2015 is an extrapolation made by PIK from previous years. Combining GHG emissions in 2015 (bar LULUCF) from PIK primap database 2.0 database and LULUCF emissions in 2015 from PIK database v1.2 also shows Australia has the world’s 15th largest greenhouse gas emissions, including LULUCF, in 2015. Per capita emissions in 2015 come from combining above 2015 figure for GHG emissions and Australia’s population in 2015 from the World Bank. Australia’s pledge to reduce its emissions 26-28% below 2005 levels by 2030 comes from its NDC submitted to the UN in 2015. Country profiles | June 6. 2018. Country profiles | March 3. 2018. Country profiles | March 3. 2019. Country profiles | May 5. 2018. Country profiles | October 10. 2018.